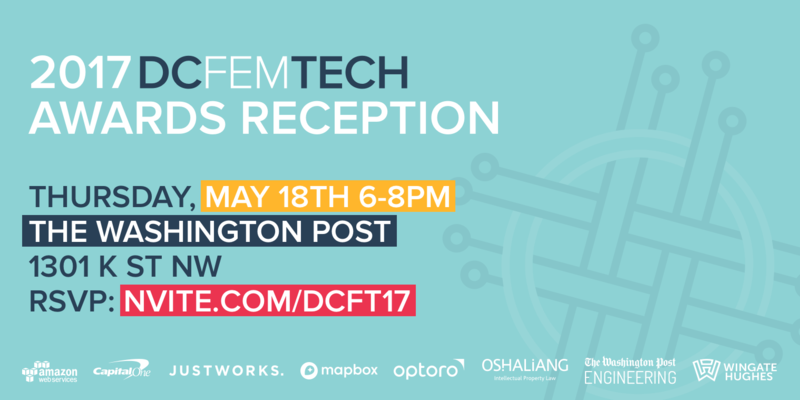 April 19, 2017 —Washington, DC — DCFemTech, the coalition of women leaders aimed at lowering the barriers to entry for women in tech by amplifying the efforts of women in tech organizations, has recognized 48 women as recipients of their annual DCFemTech Awards. On May 18th, the organization and its members will host a reception at The Washington Post to celebrate the recipients and nominees. DCFemTech opened the call for nominations for outstanding women engineers, designers and data scientists—a new category this year—based in the DC region on February 28, 2017 and received 393 submissions representing 169 women. DCFemTech aims to support organizations that enable women to build their skills and create communities in the tech scene while also encouraging companies to make it a priority to hire talented women engineers, designers, data scientists and other tech leaders. The awards program was conceptualized to focus exclusively on the DC region’s women engineers and programmers, as opposed to awards that recognize women working in non-technical roles at technology companies. Nominations were down selected by a committee comprised of engineers, designers data scientists, and executives for each category and this year’s recipients were chosen based on each woman’s impact on the organization they work for, the complexity of the issue they addressed with code or design or data, and their impact on the community, or contributions to the greater women in tech space. The final awardees ranked in the top 25 percent of their respective categories. Jennifer Safford McGerald, AOL Inc. The DCFemTech Awards are made possible through the generous support of Amazon Web Services, Capital One, Justworks, Mapbox, Optoro, Osha Liang, Wingate Hughes, & The Washington Post.